Services for Charles R. Graf, 62, who died November 8 at his home, 3635 Illinois Road, Wilmette, were conducted Saturday by the Rev. J. H. Gockel of St. John's Lutheran Church at Alten's Wilmette chapel. Burial was in Memorial Park Cemetery. 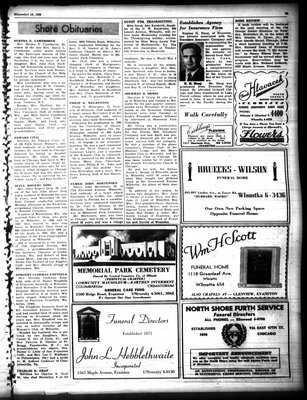 Mr. Graf, who was a retired shipping clerk at Montgomery Ward and Company in Chicago, had lived in Wilmette 25 years. He leaves his widow, Clara Gersdorf; four sons, Reinhold C. of Northfield, Robert E. of Wilmette, Charles L. of Evanston, and Harold F. of Winnetka; two daughters, Mrs. Adeline Rados of Northfield and Mrs. Clara Behrendt of Wilmette; and 15 grandchildren.